Lawrence Rowe, the only batsman to score a double-hundred and a hundred on Test debut, was born on January 8, 1949. Abhishek Mukherjee looks back at the saga of this classical, stylish underachiever from Jamaica who was later shunned by his own countrymen. There has probably been no other batsman like Lawrence Rowe. He hailed from the island team of West Indies that has produced some spectacular of batsmen. Among the most illustrious of contemporaries, Rowe stood out for his style. He drove with élan – even off the backfoot. He hooked amazingly hard; he played the late cut incredibly late, often through the slips. And his nimble-footed aggression meant that he could tear any spin attack to shreds. And when he hit through the covers off the backfoot, it looked so regal that everything else on the ground seemed pale in comparison. Rarely has a batsman promised such greatness and then fallen to levels such mediocre. Any batsman of his technique, power, reflex and panache was destined for lofty heights. And yet he finished with just 2,047 runs from 30 Tests at 43.55 — significantly higher than his First-Class average of 37.57. Rowe was an obvious choice when he made a classy 227 in a tour match against the visiting New Zealand side. He was an obvious choice for the Test at Kingston. He responded with knocks of 214 and an unbeaten 100 — the only one to score a double-hundred and a hundred on his Test debut. And his debut aggregate of 314 runs still stands. Sabina Park never disappointed Rowe. Two years later Rowe scored 120 at the same venue. In the next Test he bludgeoned a 302 against a strong England attack off 430 balls at Kensington Oval. He massacred a potent English attack all over the park — in style. He always seemed to see the ball early, and he was as lazy and elegant as he was lethal; it was dangerous for the opposition and a delight for the spectators, more so because the supreme grace lasted for a period of over 10 hours. It was in this innings that Rowe hit the most famous stroke of his career — a flat hook off Bob Willis that went straight, almost at head-level, into the stands over square-leg. And to add insult to the injury, he used to whistle a tune after completing every shot, as if nothing had happened! At the end of the England series Rowe’s Test average stood at 70.68 after 12 Tests. The numbers were phenomenal, and he was easily the best batsman in the world. Comparisons with Don Bradman and George Headley had already started. To nobody’s surprise he was called up to play for Derbyshire. It was then that the ailments began: he developed hay fever and the occasional headache, and — worst of all — Rowe was diagnosed as allergic to grass. He still continued to play, but with reduced success. Then, when West Indies toured India later that year for one turned out to be a humdinger of a series, Rowe failed miserably even in the nets. It seemed that there was a problem with his eyesight, and he was rushed home. The opticians found that Rowe had a vision better than 20-20 — he could see so well that he could read the manufacturer’s name on the chart. However, he was diagnosed with pterygium, resulting in growths in his eyes blurring his eyesight. His right eye was almost completely covered, and the left one was partially affected as well. He had to undergo surgery, but the archaic contact lenses often made his eyes water. The eyesight and reflex — attributes on which his game was built — were gone. He came back, though, in what was marked as the ‘unofficial Test championship’ Down Under, Rowe began with 28 and 107 at Brisbane, managing to hold on to his 70+ average. Thereafter it all went downhill. He never reached the lofty heights he had once perched so comfortably at, though he kept on scoring runs every now and then. Picked for World Series Cricket, Rowe had one last hurrah — his 175 against the Australians. The legendary drives and hooks came into play once again, and a he played one so late that Rodney Marsh had almost gathered it. Ian Chappell at first slip had no time to react. It made even the otherwise composed Richie Benaud ecstatic, and for a while it seemed that the Lawrence of Jamaica — as he was often called — was back at his prime. 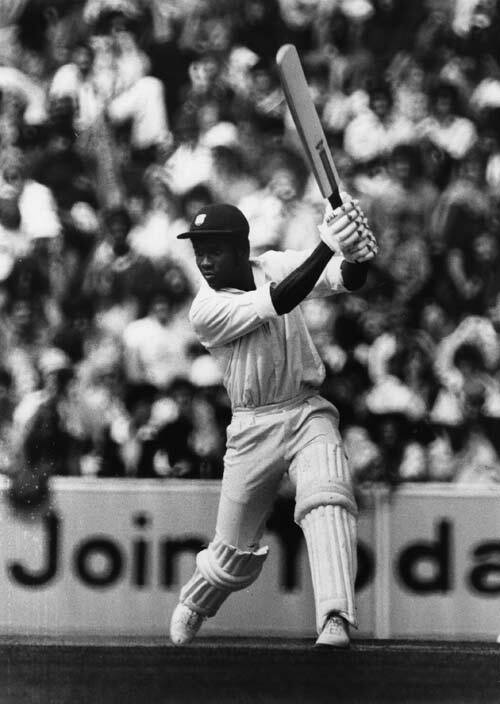 After quitting in 1980, Rowe led a rebel West Indian team to South Africa in 1982-83. As a result he was shunned in his favourite Kingston: he was generally considered an outcast by the public; the general tone was that Rowe had betrayed them; as a result he was forced to shift residence and settle down in Miami. Along with Lance Gibbs, he was largely responsible for organising international matches in Lauderhill, Florida. In 2004 Rowe was named as one of Jamaica’s five greatest cricketers of all time – along with Headley, Michael Holding, Courtney Walsh and Jeff Dujon. On June 20, 2011, Rowe was honoured at Sabina Park during the lunch interval of the India Test along with Holding and Walsh; a stand was named after him, and he sincerely apologised in public for making the tour about three decades back. It was not to last. Barely three months after naming the players’ enclosure in the northern stand after Rowe, the Jamaica Cricket Association (JCA) withdrew the honour following Rowe’s comment in a radio interview that he had done nothing wrong by going to apartheid South Africa in 1983 and 1984. He had been banished in spirit from his homeland forever.